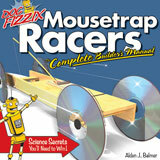 Mousetrap powered race cars are a fun way to combine woodworking with other materials to make cars that are a lot of fun. Learning about work and energy at the same time is just an added bonus. The book Mousetrap Racers: Complete Builder’s Manual takes a lot of the frustration and guesswork out of it.